Bangkok (Thailand) – September 16, 2018 (travelindex.com) – Thanpuying Varaporn Pramoj was a guest of honour at the ribbon cutting ceremony to mark the official opening of the 19th World Gourmet Festival at Anantara Siam Bangkok Hotel on 3 September 2018. The festival held from 3 – 9 September 2018, has raised a substantial amount to support the Princess Soamsawali AZT Fund for Pregnant Women of the Thai Red Cross Society. Funds were raised from THB 600 of every dinner ticket sold, as well as proceeds from auctions during the festival. The auctions featured accommodation vouchers donated by Anantara and Minor Hotels & Resorts around the world, and Turkish Airlines business class air tickets for two people. The event would not have been possible without the participation of guest chefs, food and wine experts from around the world, as well as the support of key sponsors. 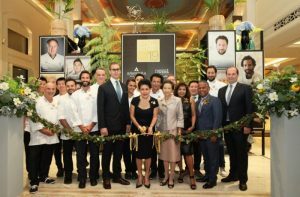 Joining the star studded line up of chefs this year were international stars – celebrity chef Bobby Chinn, famed chocolatier Paul A Young, and sommelier Seju Yang.